Andros is located in northern Cyclades and is one of the most fertile islands of the complex. Though it has a mountainous terrain, it is blessed with underground water streams, green valleys, impressive gorges and a wonderful coastline. It would seem that Andros is an island for peaceful holidays, but this is not entirely true. Indeed, there are a lot of opportunities for active holidays in Andros. Choose one of many comfortable apartments to stay and from there you can depart for your outdoor adventures. Active holidays in Andros may include jeep safari, hiking, windsurfing, trekking and many more, organized by trustworthy companies with highly skilled and experienced guides and instructors. So, pack your bags and come to explore Andros surroundings, discover ancient paths, traditional settlements with Cycladic architecture, and have fun enjoying the beautiful nature of the island. 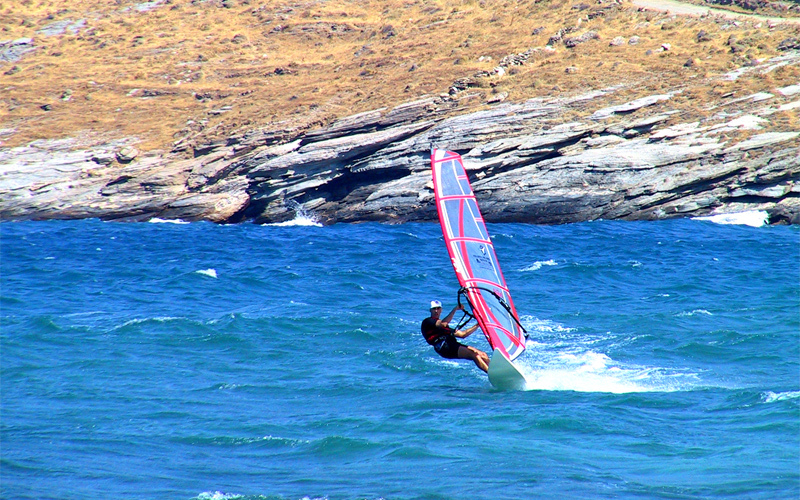 Andros is one of the most suitable islands of the Cyclades for windsurfing, as it has ideal conditions for water sports. Stunning beaches with golden sand and deep blue waters get affected by strong winds, creating perfect waves for lovers of such sports. 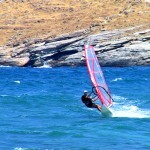 Excellent windsurfing clubs are found on the beaches of Agios Petros and Kypri. These beaches are not secluded, so they are not far from Andros apartments and other amenities. They provide windsurfing lessons for all levels and ages, along with the necessary equipment. A team of great instructors will inspire and teach you the secrets of the sport. Ormos pebbled beach is also a popular windsurfing spot. Enjoy active holidays in Andros by following one of the numerous hiking trails around the island. Hiking is a very popular activity in Andros, as it has breathtaking scenery with verdant valleys, lovely waterfalls, green mountains and secluded beaches. During the hikes, you can learn about the history of the island, as you walk past old churches and monuments, and get a taste of its pure, untouched nature. An interesting hike, which will take you over stone bridges to traditional villages through old watermills and picturesque countryside, is the one starting from Menites springs and reaching Chora, the capital of Andros. Explore the thick forests of oak, chestnut, walnut trees and plane trees, and hike on the slopes of the mountain in the hike between Batsi village and Arni (or Arnas), or enjoy the scenic gorges and old farm houses from Chora to Korthi Bay. Did you know that the small island of Andros is also ideal for jeep safari? For the adventurous type of tourists, Andros offers a lot of opportunities for jeep safari, especially in its north-eastern parts. There are a lot of organized 4×4 drives, but visitors can also arrange their own. Driving through the impressive landscape of Andros is a thrilling experience. A very popular drive passes through the protected wetland at the east side of the island and allows visitors to explore the natural wealth from the hill sides at Vourkoti village to the stunning beach of Ahla. Complete your active holidays in Andros with another very beautiful drive that includes the north-eastern coastline of the island towards Zorkos beach. There you can enjoy a swim in the unique biotope and also hike the green valley in the old watermills village of Froussaioi.